Sydneysiders…and father and daughter, Peter and Jacqui Lowy will play in basketball events at next month’s Maccabi Australia International Games…but they will not be sporting the green and gold. The Lowys call Los Angeles home and father and daughter will be wearing the colours of the United States. 21-yr-old Jacqui will be competing in the Open Women’s Basketball while Peter takes his place in the USA Masters Men’s side. Jacqui was born in Sydney but left when she was two for the U.S. 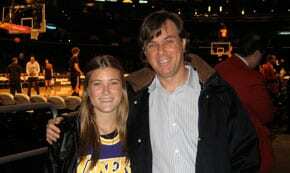 Both father and daughter have dual Australian and U.S. nationality. Ami Monson, Program Director for Maccabi USA, told J-Wire: Rarely do we get a combination like this playing for us at the same Games. It’s even more exciting for them as it is also a homecoming for them and a chance to be with their family at New Year.